Vertebral Compression Fracture: vertical collapse due to downward pressure exceeding bone’s ability to endure it. In a vertebral compression fracture, the vertebral bone collapses. This happens when the vertebral body is vertically compressed, and weight put on the vertebra exceeds what it can endure. More than one vertebra may be affected by this condition, which is most commonly caused by osteoporosis, or weakening of the bone due to lack of calcium and other factors. If the fracture is a result of osteoporosis, the vertebrae in the thoracic and lumbar section are usually affected. Back trauma and tumors growing in or near the spine can also lead to vertebral compression fracture. One vertebral fracture increases the risk of further fractures five-fold. In the early stages of the fracture, the break in the bone can get worse without any symptoms. Pain or other symptoms are usually not present when resting, but worsen with walking and activity. 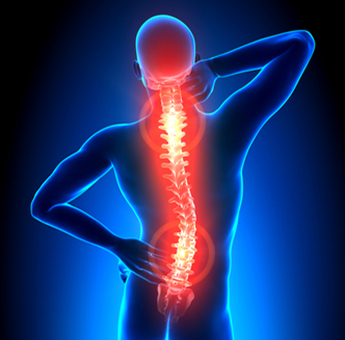 Spinal mobility can be limited, and weakness and numbness may be felt in the affected area. Multiple fractures may cause kyphosis, a hump-like curvature of the spine often called a "dowager's hump." Severe thoracic kyphosis can cause neck pain if the patient has to strain his or her neck to look forward. Kyphosis may put pressure on the spinal cord, causing numbness, tingling, weakness, difficulty walking, and loss of control of the bowel and bladder. When vertebrae collapse, each vertebra loses as least 15-20% of its height. Due to this, significant height loss can occur with multiple vertebral compression fractures. This height loss alters the muscles in the back, which can cause pain from muscle fatigue even after the fractures heal. Depending on the severity of the height loss, patients may complain of hip pain, particularly at the top of the hip bone, due to the bottom of the patient's rib cage rubbing against his or her hip bones. The height loss can also cause the appearance of weight gain as the patient's abdominal contents are compressed, causing the abdomen to bulge out. Despite the appearance of weight gain, the compression of the stomach causes weight loss, constipation and other problems. The crowding of internal organs can be very serious, even affecting lung function. In order to diagnose vertebral compression fractures, a physician will review a patient's medical history and follow with a physical examination, looking for kyphosis and tenderness over the injured vertebrae. An X-ray can confirm the diagnosis, and an MRI may be ordered to see if nerves, discs or any soft tissues near the fracture are being affected. An MRI can also reveal if the fracture is old or new. A CAT scan and a bone density test, or DXA scan, may also needed. If a tumor has caused the fracture, a biopsy will need to be performed on a piece of the affected bone. Compression fractures found in elderly patients with osteoporosis are the most common and can be treated with medication and calcium supplements. In these patients, the fractures generally do not cause spinal cord injury. Treatments for fractures caused by tumors depend on the type of tumor. In other patients, pain and bone density medication, rest, and activity modification will be prescribed. Bracing and physical therapy may also be recommended. Most compression fractures will heal in 8 to 10 weeks with bracing, rest, and pain medications. If surgery is needed, recovery time will be significantly longer. If pain continues or the fractures do not heal over an extended period of time, surgery may be recommended. If there is any loss of function due to pressure on the spinal cord or nerves, surgery may be necessary. Procedures to treat vertebral compression fractures can be minimally invasive, and include balloon kyphoplasty and vertebroplasty.